When you import the asset into your project, you’ll get a TopDownEngine folder, containing three subfolders. I recommend leaving that folder as it is, and not modifying its content. Instead, create a dedicated folder for your game’s assets, and if you need to modify code, just extend the TopDown Engine’s class into one of yours. If you want to know more about that, look at the “Inheritance” section. Here’s a rundown of the contents of these four folders, and of the general folder structure. PhysicsMaterials : a few physics materials used across most demos, but not specific to any. Achievements : Mostly achievements rules, the rest of the achievements scripts are in MMTools if you ever find yourself looking for them. Characters : here you’ll find all the scripts that make the characters move and act. From the controllers, character abilities, to AI scripts and weapons. GUI : As the name implies, here you’ll find everything GUI related : level selector, pause screens, etc. Spawn : All spawn specific scripts go in there. 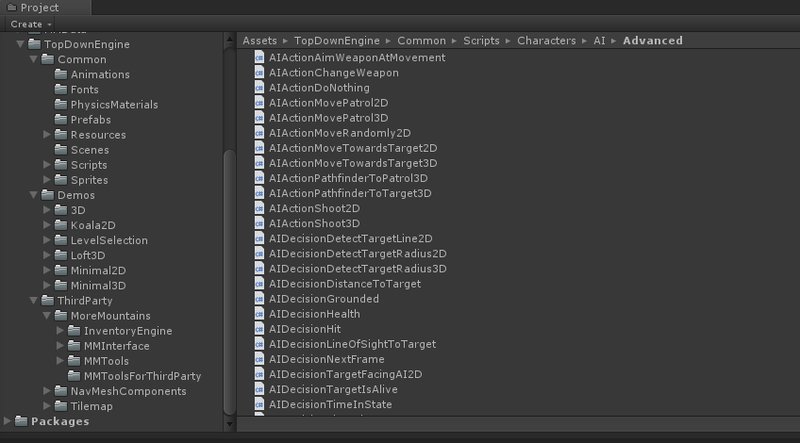 ThirdParty contains scripts and resources that are not directly specific to the TopDown Engine. The Inventory Engine is another asset by More Mountains, usually sold separately, but included in the TopDown Engine as a gift. As its name implies, it’ll help with creating and customizing inventories. The MMTools are helpers and small classes used throughout all More Mountains assets. Some of them may not be used in the TopDown Engine, but I’d advise against removing them. The unused ones won’t make your build heavier, so it’s just safer and simpler to keep them. This documentation doesn’t cover them in details, but they’re all commented, and explained in the API documentation if you’re interested. The MMToolsForThirdParty are More Mountains scripts aimed at piloting or enriching Unity APIs that are not yet built in, such as Cinemachine or the PostProcessing stack.